Cameroon legend Francois Omam Biyik has launched a book to reflect on his memorable football career. The 50-year-old launched his book called “Mon But” (My Goal) at a glittering event held in down town Younde in Cameroon. According to media reports, the book talks about the former Sampdoria (Italy) and Rennes (France) striker's goals and dribbling technique. He also talks about his memorable downward header that gave the Indomitable Lions a historic 1-0 win over then world champions, Argentina during 1990 FIFA World Cup in Italy which left him etched in the minds of football lovers across Africa. 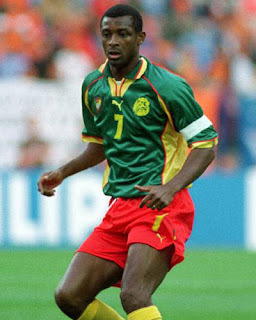 Omam-Biyik remains one of the most celebrated football players of the Cameroonian national side having played at three World Cups in 1990, 1994 and 1998. Apart from the national team, he also turned out for French clubs such as Olympique Marseille, Stade Rennais and RC Lens. Based on his aerial ability, 'Omam-Biyik' was later used as a nickname for a headed goal. Although he never won the CAF African Footballer of the Year Award, he finished third in 1987 and 1991. Omam-Biyik retired from the game after the 1999/2000 season before moving to Colima in Mexico where he was head-coach of a second division side.